Choose a selection... Brown Belt - 32" Brown Belt - 34" Brown Belt - 38" Brown Belt - 40" Black Belt - 32" Black Belt - 42" Black Belt - 46"
Individually poured silver-plated buckles that reflect coastal life. Each comes with an English bridled leather strap. Striped Bass Buckle Dimensions: 4.5" x 2" x 0.5"
Brook Trout Buckle Dimensions: 4.5" x 2" x 0.5"
Sperm Whale Buckle Dimensions: 5" x 1.75" x 0.5"
Very pleased with the quality and detail. exceptional quality and detail-was perfect xmas gift! Love it. Bought a second for me and one for my friend. A great gift for a fisherman!! Well executed buckle, nice size, and a high quality belt included. A good value. 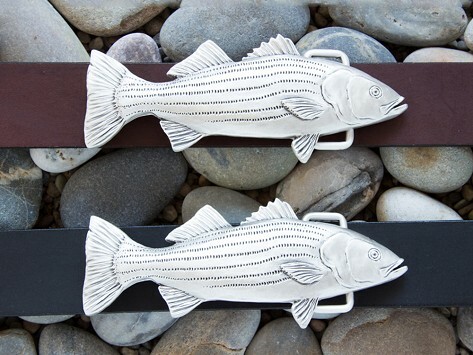 With handcrafted silver belt buckles from Wind & Waves, you can put your passion for the sea front and center. Hand poured, silver plated, and Made in the USA, the buckles are created using molds carefully crafted by students from the Rhode Island School of Design. 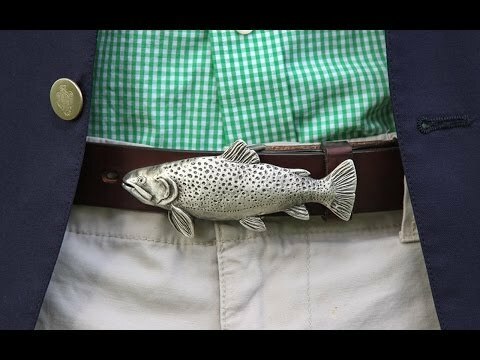 Fishing enthusiasts will appreciate not only the aesthetic appeal, but the fact that the Sperm Whale, Brook Trout, and Striped Bass buckles are anatomically correct right down to the last gill. Wind & Waves owes its authenticity and artistry to founder Rick Gauntlett’s interesting background as both a commercial fisherman and the creator of Grillie car ornaments (also a Grommet). Beneath the silver plated surface, each buckle is constructed using a lightweight, non-lead metal alloy designed to fit comfortably below the waistline. Fishing season or not, these sea creatures add a touch of coastal styling to any outfit.